All my main development machines are now running Visual Studio 2012. I have a few new projects in VS2012 and have begun updating my old projects to it as well. I ran into an annoying issue today that I need to post. My Blog by Email site was built using VS2010 and ASP.NET MVC 3. My new machine, which I am working on right now, is running Windows 8 and VS2012. Recently a new user started using the site and discovered a few bugs I needed to get fixed. I cloned the repo from Bitbucket and opened the solution in VS2012. My first tip-off that there was an issue is when the Migration Report displayed 7 errors all on the _bin_deployableAssemblies\ folder. My second is when I went to run the project and the build failed for the same 7 files. If you recall the _bin_deployeableAssemblies folder is used to aid in bin deploying MVC 3 applications to [shared] hosts which don’t have ASP.NET MVC 3 loaded. You can read more about it here [@haacked.com]. Starting with MVC 3 Tools Update we are now using Nuget package references, which means that your project is automatically bin-deployable. Since the tooling gesture is no longer necessary it was removed from VS 11. The fix here is really simple. 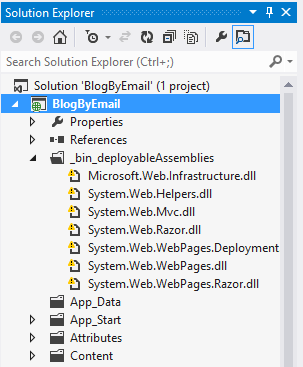 Remove the files and _bin_deployableAssemblies folder from your project. Everything should compile just fine. Now the one part I have not figured out is where or how we get the files that used to be in _bin_deployableAssemblies. I don’t see them in the bin folder as I assumed they would be. I will need to do some test deployments at my host, Arvixe (I think they didn’t have MVC 3 loaded). Add a comment below if you h ave some knowledge around this.